Tbilisi- Mtskheta – Kakheti – Kazbegi – Samegrelo – Svaneti. Tour in the Holy City – Mtskheta : Svetitskhoveli Cathedral (11th cent.) Jvari monastery (6th cent.) Samtavro, Shiomgvime ( ‘the cave of Shio’). Tour in Kakheti : Signagi (city of love), Bodbe, Gremi fortress, Kvareli, Ilia lake, Telavi . Wine tasting. 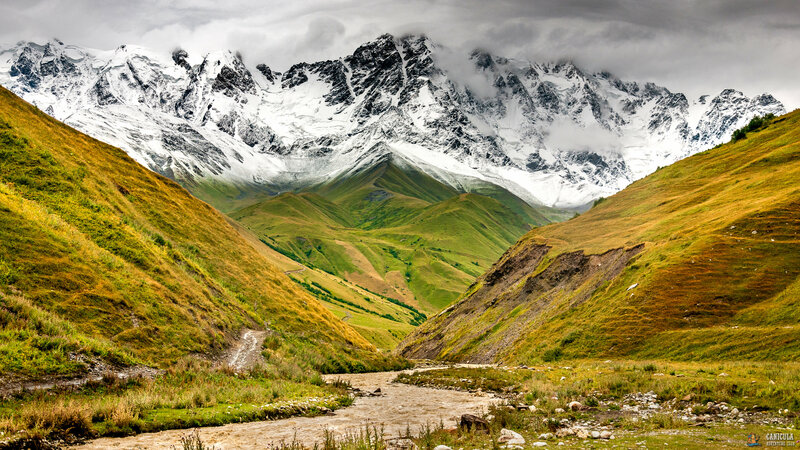 Tour in : Ananuri, Kazbegi ( rise by jeeps to Gergeti + ). Tour in Samegrelo : Zugdidi Town, Canyons of Martvili and Okatse. Overnight in a local hotel. Tour in Svaneti : Mestia, Ushguli ( rise by jeeps). Overnight in a hotel in Mestia. Free time in mestia . Return to Tbilisi , Transfer to the airport. Meeting at the airport. Transfer to a hotel. Placing. Tour in the most interesting parts of the city. You will see many amazing and extraordinary places in Tbilisi: Narikalafortress, Mtatsminda (Holy Mountain), Old Tbilisi, Tiflis sulfur bathhouses fed by natural hot springsfrom which comes the legend how Tbilisi was founded. You will also see old architecture, ancient churches, and beautiful sights of the city. Tour in Kakheti – the cradle of wine. Kakheti is Georgia’s main wine-producing region in the country’s east.Friendly environment, historic sites, beautiful nature and hospitality of the people makes visiting Kakheti always a pleasure. You will see the monastery of st.Nino at Bodbe. This place is stunning with it’s marvelous gardens, vineyards, sights of Caucasus mountains and miraculous spring. You will also visit Signagi – the City of love. After this you will drive to Kvareli and see beautiful lake, fortress of Gremi. Wine tasting will be held in the local winery . You will taste several types of local Georgian wine and see the longstanding technology of wine making. After you’ll drive to historic city Telavi and return to Tbilisi. Drive to Kazbegi. On the way you will visit Ananuri fortress, Jinvali Water Reservoir and see an amazing view of the Gudauri sky resort (photoshoot at beautifull sights). Stepantsmindacommonly known as Kazbegiis a small town in the north-east Georgia. It is well known and considered to be one of the must see destinations in Georgia due to amazing views of mountains and stunning nature. You will see Gergeti Trinity Churchlocated on 2200 meters above sea level( the rise by jeeps). Return to Tbilisi. Travel to Samegrelo. First you’ll visit extremely beautiful canyons of Martvili and Okatse and explore the wild nature on boats. Then you’ll go to Zugdidi and see Dadiani Castle and it’s stunning gardens. Night in a hotel in Zugdidi. Travel to Svaneti -Mestia. This place is known for it’sarchitectural treasures and marvelous landscapes. The famous Svanetian towers erected mainly in the 9th-12th centuries, make the region’s villages interesting and amazing to explore. In the province are dozens of Georgian orthodox churches and various ancient historical buildings. Architectural monuments of Upper Svaneti are included in a list of UNESCO World Heritage Sites. Drive to Ushguli (the rise by jeeps) on2200 meters above sea level. The meaning of ‘Ushguli’ is ‘ brave heart’. It is located at the bottom of the highest point in the nation of Georgia- Shkhara . It is also one of the highest continuously inhabited settlements in Europe. Return to Mestia. Night in a local hotel. Free time in Mestia. Return to Tbilisi. Transfer to the airport.